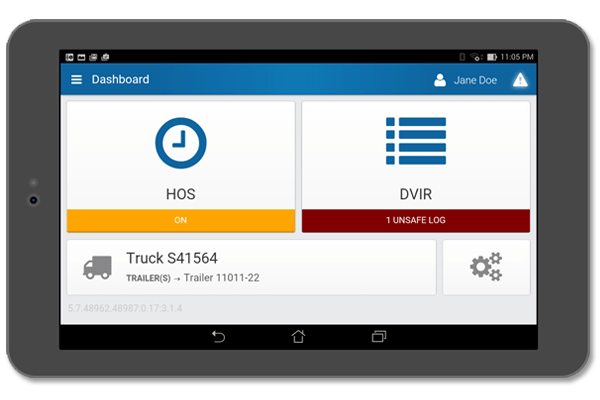 Geotab Drive is a savvy Hours of Service electronic logging device (ELD) and vehicle inspection application. The FMCSA regulates commercial driving; they are getting ready to release a new set of rules in September, 2015. The regulation changes add clarity around the types of devices, how they are allowed to communicate, and what and how data is presented. These regulations have been debated and argued for the last several years leaving the rules to be highly anticipated. It is expected in September 2015 fleets will need to switch from paper to electronic logs and Geotab is working hard to ensure the devices are fully in compliance with the new ELD rules. Depending on whether or not fleets are already using electronic logs or are still using paper logs, the transition period slightly differs. Any Commercial Motor Vehicle (CMV) has to transition from paper logs to ELD within 2 years after the release date of the new rules. Fleets using an AOBRD on the date of the release of the new regulations have 4 years to make the transition to the new ELD rules. Geotab Drive is currently available on the Apple App Store and the Google Play Store. The application connects to the GPS GO Device in order to provide an automated process for creating accurate records of the drivers time spent in each duty status: On Duty Not Driving, Driving, Sleeper Berth, and Off Duty. The system is very user friendly and gives drivers more time to complete their daily tasks by simplifying the annoyance of always documenting their time. Through automating vehicle inspection reporting and driver logs, and depending on the number of duty status changes required by the driver to record, fleets are finding as much as an extra hour a day! That translates into lots of added productivity, not to mention the increased accuracy of the reports. These features provide some amazing advantages to fleets, however the future of Geotab Drive is even more compelling. There will be support for two-way messaging for safe communication with the driver and ease of dispatch. Just like the MyGeotab software offers add-in ability to the base software, Geotab Drive will soon have the same functionality. This will allow end user fleets and other value added partners to add functionality directly into the Drive application. For example, an add-in that shows a driver how many deliveries he made today on-time, based on his scheduling and routing software, or how closely he met the estimated miles on the projected route from the scheduling and routing program. Another option would be to provide the driver interface to a dispatch application where a driver has one application for all of his or her in-vehicle needs for HOS and dispatch.